The Beiter V-Box is threaded 5/16 internally each end. 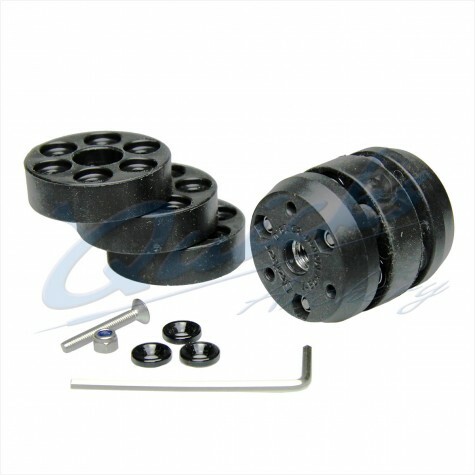 The central disc membrane of the three is interchangeable and the V-Box kit comes with a range of 4 different stiffness. A system of weights and spacers are used to place and space the weight to suit your bow and technique. V-Box Damper as a stand alone unit: You can also use the Beiter V-Box as a stand alone universal tuneable damper with the rods and weights you already have. It has the advantage of tuneability in stiffness to the weights off the end of it so that they are supported and properly damped. What is the Beiter V-BOX? The Beiter V-BOX has not only been developed for the Beiter Centralizer, but is universal and can be used with almost all other stabiliser systems! How does the Beiter V-BOX system work? Where should, or can, the weight be attached? Due to the lever effect, shifting the weights forward on the screw changes weight distribution and dampening, achieving the desired balance with less weight than usual! The various colours available can be combined to individually customize your Beiter V-BOX System and stabilisation! 4 - V-BOX, no base plate, 4 x 3 oz. weights, with 3” thread mounted in the back. 3 x 3 oz + 1 x 1 oz. weight with 61mm thread in front. Total weight: ~675 grams / ~24 oz - MAXIMUM WEIGHT FOR THE BEITER V-BOX SYSTEM! Beiter V-BOX Adapter 1/4 IN - 5/16 x 1" (25mm): Beiter V-Box Technical Sheet The IN Adaptor is..
Beiter V-BOX Adapter 1/4 OUT - 5/16 x 1" (25mm) Beiter V-Box Technical Sheet The OUT Adaptor..
Beiter V-BOX Compensation Spacer 3mm - 6pcs Spacers can be used to move the disc weights so as..
Beiter V-BOX Weights 3oz (15mm) Set of 3 Beiter V-Box Disc Weights : These fit over the..
Beiter V-BOX Weights 1oz (5mm) Set of 4 Beiter V-Box Disc Weights : These fit over the..
Beiter V-BOX Rear Set Screw 5/16-24 x 1" (25mm) The Rear Set Screw is 5/16 threaded, for..
Beiter V-BOX Front Screw 5/16-24 x 28mm (Max 4oz) The Front Screw holds the weight system to..